The Tour Experts travel agency was created by licensed professional tour guides, which decided to offer their services directly to the guests of Crete. After working for several years all over Greece, in 2004 we decided to settle down on beautiful Crete. We gained valuable experience in the field of tourism over the past years, working mainly on excursions in Crete and the nearby islands – Santorini, Rhodes and Kos – during summer and during winter we continued offering our services abroad (mainly in Europe). After returning to our birthplace, the beautiful Crete, we decided to focus on the tailor made tours and excursions and the excellent service. We can organize tours and excursions with special interests for conferences and incentives, coach tours for groups, educational excursions for colleges and schools with licensed tourist guides with further professional, academic and other special qualifications to illuminate your tour. (Besides working as registered guides are also graduates of Archaeology, History and Art). We can arrange chauffeur services, transfers and professional licensed travel guides for your private tour in Crete. Our travel agency is focusing on excursions and specializes on private tours in Crete, mainly. We can offer our services directly to small groups and families that want to avoid big groups and crowds. Plan your tour, according to your needs. Choose the tour, the tour guide, the pace…. During your holiday you get to decide what is best for you. Explore the hidden beauties of Crete and organize your own private tour, out of the ordinary. Combine interesting archaeological sites (Knossos, Phaistos, Malia) with places of natural beauty (Cave of Zeus at Lassithi for example) or religious places (such as the Monasteries of Kera, Toplou or Arkadi). Take advantage of our experience and with our company car we can drive you around Crete …. Our Service provides a licensed qualified guide and chauffeur! Take advantage of our chauffeur service, not just a driver, but a professional qualified guide, to maximize your experience while exploring Crete. An amazing opportunity for the travelers, who want to avoid driving and still are interested in experiencing the island of Crete. Let us design your vacation on Crete and take advantage of the combined tours and excursions or even the opportunity to relocate i.e. from Heraklion to Chania; instead of a transfer you can combine it with a tour. In doing so you will depart from your hotel in Heraklion with your luggage and you will reach the hotel of your choice in Chania, but on the way you will have the chance to explore the villages and the places of natural beauty , the monasteries, highlights etc , with an experienced guide. The chauffeur service is available with our company car for 2 participants. In cooperation with a trusted partner we can offer the chauffeur service with a minivan for 5 to 6 participants. Quality of service is guaranteed. 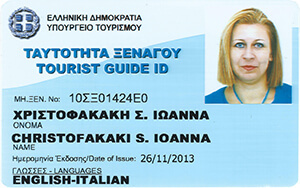 All vehicles are licensed issued by the Greek National Tourism Organization regarding the transportation of our guests. Tour Experts company is highly qualified to introduce you to the rich culture of modern and historic Crete and Greece. The Tour Experts Travel Agency was created by Joanna Christofakaki and Panos Kritikos. We graduated from the Guides College of Mytilene 1997 and started working as professional licensed guides on the island Rhodes, where we lived for 2 years. On 1999 we decided to move to the nearby island Kos, where we had the chance to work with Plotin (representing Thomson) and Voukouvalidis Tours (represending Tui), Kosland Tours (representing First Choice), Dodecanese Travel and Rhodos Tours Traveland Kos. We were working on the island Kos until 2002. The next year Mr. Kritikos returned back to Rhodes and worked there for the season of 2003, while the same year Mrs Christofakaki came on the island Crete, back to her birthplace. The year of the Olympic Games of 2004 we focused on working on the island Crete, were we started our family. Having our basis in Heraklion (central Crete), we started cooperating with tour operators, such as Tui, Versus group, Tez, Cretan Holidays, Deltanet. During the beginning and the end of the season 2004- 5 Mr. Kritikos cooperated with Agora travel in Athens guiding groups all over Greece and Rhapsody Travel for Cruise Ship shore excursions, at Olympia, Mykonos and Kefalonia. During winter months, which is considered to be low season for Crete, we invested in learning foreign languages, in order to improve our career chances. 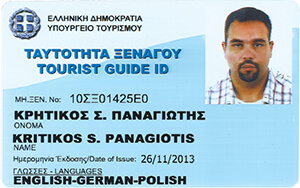 (Mrs Chistofakaki English and Italian and Mr. Kritikos English, German and Polish). Mr. Kritikos also worked during the winter period of 2010 – 12 abroad, mainly in Europe, escorting Greek senior groups and school groups from Crete. This season of 2014 we decided that the time was right to take one more step and to create our own company, a travel agency, that we will be able to control the little details that make the difference. That is the reason , that we decided to focus not only on tailor made tours for individuals and small groups, but also for normal groups that visit Crete and wish to combine sites and live a true Cretan experience. We will try to act as insiders and tell you all the information needed to make the right choice for you and your friends while staying on Crete. The purpose of our company is to provide high quality of service, with friendly approach to all our guests. We are available to answer your questions , whether it concerns a tour , or information about our beautiful island. Always service – minded we try to fulfill your wishes, so that you can take advantage of every second of the excursion. Take some time to explore our programs and excursions and if you cannot find what you are looking for send us a request. We are able to organize tailor made tours according to your standards. Crete is the largest and most populous of the Greek islands, the fifth-largest island in the Mediterranean Sea, and one of the thirteen administrative regions of Greece. The island Crete is a different world compared to other parts of Greece. Crete is a place with its own tradition, its own character and its own dialect. Local people are very proud of their Cretan origin. The island forms a significant part of the economy and cultural heritage of Greece while retaining its own local cultural features (such as its own poetry, and music). Visit all archaeological sites, Knossos the palace of King Minos, Phaistos the palace of King Radamanthys, Malia the palace of King Sarpedon according to Mythology. But don’t visit only the well known Minoan palaces, but also the hidden beauties of Crete, the Plateau of Lassithi with the Cave of Zeus, the Messara plain with the beautiful beach of Matala.